On January 25, 2018, composer John Morris died at the age of 91 in Red Hook, New York. over the course of his career, he has produced some of the most iconic scores ranging from films by Mel Brooks such as The Producers and Blazing Saddles; to more mature work like The Elephant Man. Even if he wasn't a household name, he managed to create some of the most empathetic and effective music in comedy and drama, and leaves behind an impressive body of work. Who could forget the melodies of a Brooks film? A lot of the credit is owed to Morris, who foudn a way to make melodies funny and catchy. With an impressive career spanning 30 years, he leaves behind an impressive body of work that will leave film fans happy and dancing, no matter how much they try to resist. John Morris was born on October 18, 1926 in Elizabeth, New Jersey. His father designed the revolving doors for the Tiffany & Co. building on Fifth Avenue. During his youth, he became attracted to performing music, even constantly playing the piano. Despite moving to Kansas in his youth, he returned to New York City in the 1940's to study at Julliard School and The New School for Social Research. 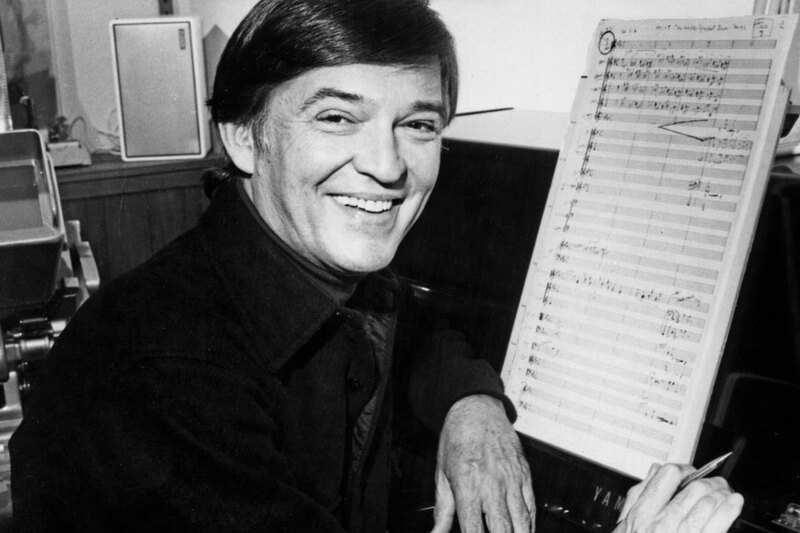 Following his time there, he performed incidental music for various productions, including Broadway shows such as Wildcat, Hot Spot, and Baker Street. He had his own musical, A Time for Singing, which premiered in 1966. During this time, he also began his long partnership with Mel Brooks on work like Shinbone Alley and All-American. Still, it was The Producers that he gained his claim to fame. It was Brooks' directorial debut, and Morris did the incidental music for it and the arrangement of the famous tune "Springtime for Hitler." He also worked with Brooks on Blazing Saddles, where he received an Osacr nomination for helping to write the theme song. The two would work together on almost every film of Brooks career, except for Robin Hood: Men in Tights and Dracula: Dead and Loving It. The reason was that Morris had other commitments. Morris also worked with Brooks' collaborator Gene Wilder on such films as The Woman in Red and The World's Greatest Lover. His second Oscar nomination came for The Elephant Man, which was a film that Brooks produced but kept his name off of to avoid people believing that the David Lynch film was comedic. He also wrote TV themes, including for the show Coach. Morris lived a happy life with his wife Francesca Bosetti and his children in Red Hook, New York. While he retired in 2004 following The Blackwater Lightship, the praise for his work continued. Brooks in particular spoke highly of him, claiming that "He was my emotional right arm. Music tells you what to feel and he knew what I wanted you to feel. He composed it and made it happen." It's a partnership that gets taken for granted, but helped to produce some of Brooks best work musically. Morris is a composer with personality, and someone who could make the most of any piece of music by adding personality where necessary. He was a great musician who always tried his hardest, and in the process made some of the most effective music out there. He leaves behind an impressive body of work, the likes of which will be hummed for as long as Brooks movies remain relevant (which seems infinite).